The quote above comes from Henry Petroski’s recent interview on Tech Nation. In the same interview, Petroski says that a common rule of thumb is that maintenance costs about 4% of construction cost per year. 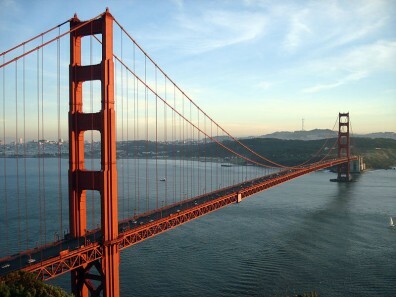 For a structure as old as the Golden Gate Bridge (completed in 1937), for example, that’s a lot of 4%’s. Painting the bridge has cost far more than building it. The bridge is painted continuously: as soon as the painters reach the end of the bridge, they turn around and start over. The engineers who designed the bridge knew this would happen. When you build something out of steel and put it outside, it will need to be painted. It was all part of the design. I’d rather say “the scientist finds a solution to the problem, but it falls to the engineer to put the real solution into production.” Sort of a theory and practice sort of thing. I wonder if they considered that there was a non-zero probability that, at some future date a paint might be developed that would last longer. The Forth Rail Bridge in Scotland, completed almost 50 years before the GGB, had a similar continuous paint-renewal process until recently – paint technology advances mean that its most recent coating will be the last for several decades. So they say. Not cheap, though.